The first tunnel unit is put into position.Credit: MTR. MTR has successfully installed the first of 11 precast concrete tunnel units for the Shatin to Central Link (SCL) cross-harbour tunnel in Hong Kong. 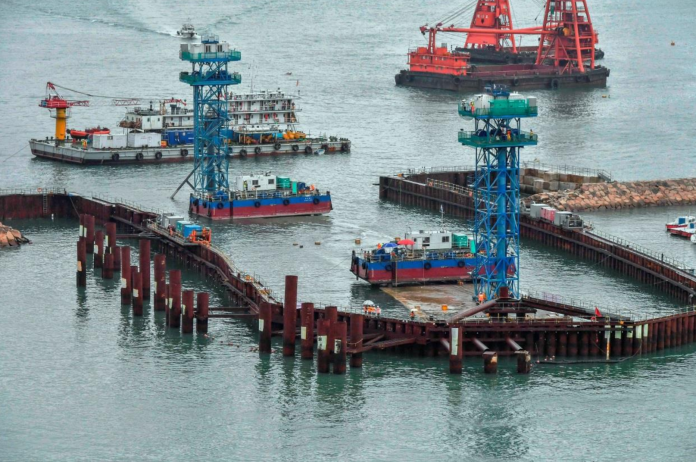 The unit was immersed into the water thanks to 4,500m3 ballast tanks and installed into dredged trenches in the seabed of Victoria Harbour, with a crew of 50 engineers, operators and workers overseeing the operation. MTR said the installation is a ‘significant step’ forward in the construction of the North South Corridor of SCL as – being the first unit to be installed – its accuracy affects the entire tunnel and the margin for error is minimal. The next unit is expected to be installed in July. SCL will extend MTR’s East Rail line thanks to the cross-harbour tunnel to form the North South Corridor. The 1.7km cross-harbour rail tunnel will link Hong Kong Island to the mainland once complete and help to relieve the pressure on existing cross-harbour rail sections and road traffic congestion. Mr T. M. Lee, general manager of electrical and mechanical construction at MTR, said: “It was an exciting moment to witness the immersion of a giant tunnel unit in Victoria Harbour again, since [MTR] overcame a similar construction challenge two decades ago when the cross-harbour section of the MTR Airport Railway was constructed. The blue section of the graphic shows where the tunnel is being built in Victoria Harbour. Credit: Assanges.